One of the aims of the Including the Excluded project is to catalogue the case files of disabled children who were in The Society’s care during the late-19th and early-20th centuries. A case file was created for each and every child who came into The Society’s care and was used to file documents created in the course of The Society’s work with that child. 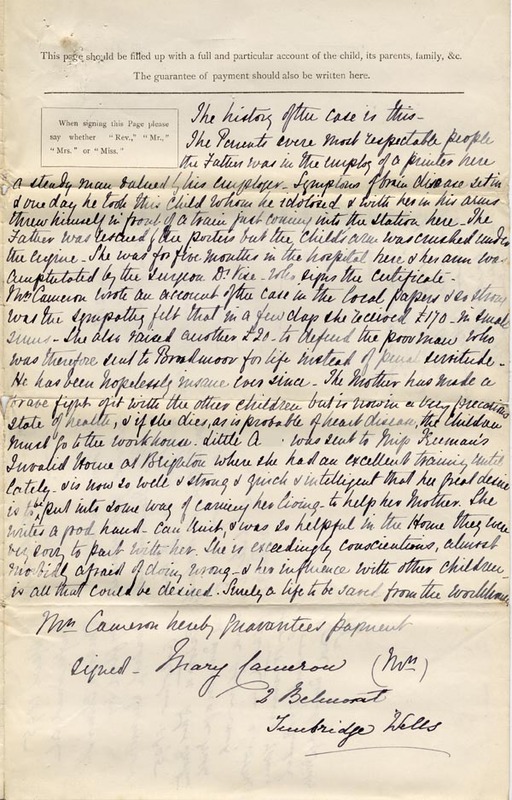 These documents often included correspondence detailing the children’s homes and foster homes that the child stayed in, and correspondence relating to the child leaving The Society’s care, either to go to work when old enough, or to be adopted or reunited with family members. There may also be other snippets of information in the case files, including medical certificates, birth certificates, and correspondence with the child as an adult. Rare case files even contain photographs. In my opinion though, the star item in each case file is the application form. These forms were filled in and kept for almost every child in The Society’s care. They describe, in detail, the child’s family circumstances, and include information about the child’s birth, home, parents, siblings, relations and schooling. Each form also contains a statement from someone who knew the child, describing why they think the child would benefit from being taken into The Society’s care. The above image shows a statement, dated 1890, in the application form for a girl from Tunbridge Wells. In the statement, we’re told that the girl lost an arm when her father threw both himself and her in front of a moving train. Luckily, both survived, but the father was sent to an asylum, which left the mother struggling to bring up their children by herself. The girl was placed in a home in Brighton, and the application was made for her to be taken in by The Society. 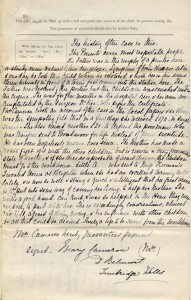 A transcript of the above image can be found here, and the rest of the application form and the other documents in this case file can be found here. Each application form also contains a summary of the homes that the child stayed in while in The Society’s care. Using the above example, we can see that the girl was accepted into The Society’s home for disabled children (this was St Nicholas’ Home in Tooting), and after five years was returned to her mother, where she was then placed in a training home to learn to be a servant. As the above example shows, the case files can contain some astounding stories. They allow us to get a rare glimpse into the lives of individual children, and so form a valuable resource to help us understand how disabled children were treated and cared for at the turn of the last century. I will be cataloguing the case files in detail as part of this project, capturing information about where each child came from and went to. The aim is to make the case files searchable so it will be possible to locate specific files, making it easier to examine and compare the experiences of different children. This entry was posted in Including the Excluded and tagged Case files by Janine Stanford. Bookmark the permalink.